Combine the top three cities in Italy with an exceptional trip through Switzerland before or after your Rhine River cruise. Starting your 9- day journey in Rome – explore «the Eternal City». Colosseum, Vatican and the Roman Forum, everywhere the eyes are pampered with history and art. Next stop will be in Venice – the city for lovers with romantic streets, hidden squares and idyllic canals offers to this city a unique atmosphere. 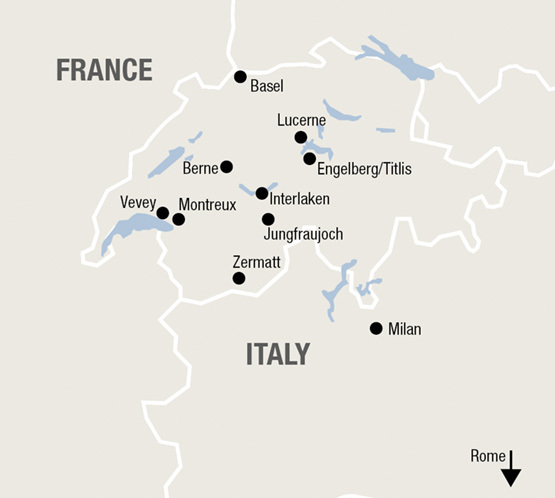 Travel by train to Milan, the fashion capitol of Italy, before you head to Zermatt. Enjoy the fantastic alpine scenery with the world most famous mountain, the Matterhorn. Then spend a day at picturesque Lake Geneva, before you board your boat in Basel on time for the Rhine River cruise. Arrive in Rome by flight and transfer to your hotel. Overnight in Rome. Vatican, Roman Forum, the Trevi Fountain, everywhere the eyes are pampered with history and art. Speaking of pampering: Browse through the lively markets and enjoy an aperitif in Trastevere. Overnight in Rome. Transfer from your hotel to the railway station. Depart Rome by high speed train to Venice. Overnight in Venice. Romantic streets, hidden squares, small islands and idyllic canals give this city a unique atmosphere. Overnight in Venice. Transfer by Vaporetto from the nearest station of your hotel to the railway station. 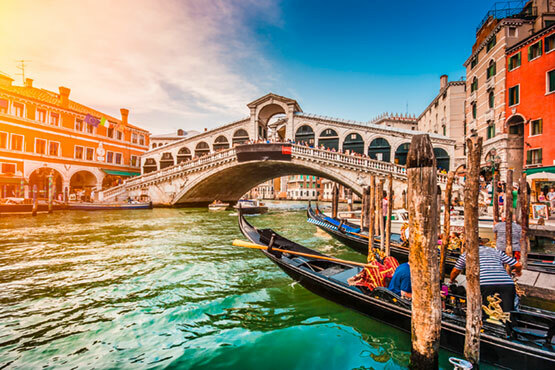 Depart Venice by train to Milan, which is well known for shopping and cultural highlights such as the Cathedral or Leonardo Da Vinci's world-famous painting The Last Supper. Overnight in Milan. Depart Milan by train to Zermatt via Brig. Overnight in Zermatt. From Zermatt, the popular Gornergrat Bahn, Europe’s highest open-air cogwheel railway, takes you up to the Gornergrat. On the Gornergrat viewing platform you are surrounded by 29 peaks rising to above 4'000 m. Overnight in Zermatt. Depart Zermatt by train for a short ride to picturesque Montreux on Lake Geneva. With your Swiss Travel Pass you are free to visit the famous Olympic Museum and even the new Chaplin’s World in Vevey. Overnight in Montreux. Depart Montreux by train to Basel where you can board the boat on time for the Rhine River Cruise. In Berne, my hometown, I particularly like the beautiful old town with its 6 km long arcades which invites you to stroll and to shop.